In short, adults need physical exercise, mental exertion, and self-confidence just as much as kids do. And karate is a great way to attain all of those things. Martial arts are not only awesome skills, but also a great way to stay in shape. If you are bored of running or doing bicep curls at the gym, then martial arts classes will be perfect for you. All you need is a healthy helping of motivation.Karate and Taekwondo lessons force you to move your body. Any type of movement will help you burn calories and get into better shape. 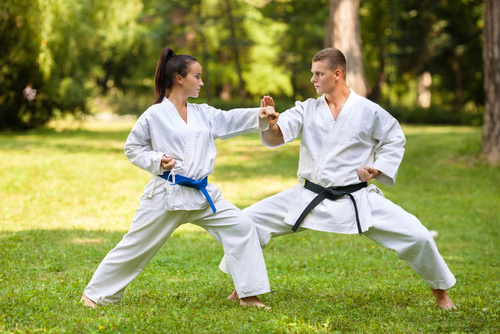 If you have never done martial arts before (or even if it’s been a while), then doing new movements and challenging your body will have an even more dramatic affect.Martial arts are not just about strength and fat burning, however. The discipline also teaches balance and flexibility, which is even more important for adults than for kids, because bodies lose flexibility as they age! Another important benefit of taking karate, Taekwondo, or other martial arts lessons is the mental aspect. Martial arts instructors train your mind while training your body. It requires focus, perseverance, and awareness to master these skills. In other words, you will be doing brain exercises without even realizing it!Especially for adults, learning a challenging new skill like karate is one of the most effective ways to boost your brainpower. It can also reduce stress and improve your overall alertness during the day, even when class is over.And finally, any time you conquer a demanding new challenge, your self-confidence will sky rocket. When you exercise, your body releases endorphins, making you happier and less stressed over all. Plus, you will be concentrating and enjoying your lesson so much that the time will pass quickly. You’re never too old, but that doesn’t mean you should wait. Don’t put it off, because the benefits are worth it. Come show the young kids how it is done! Adults can learn and accomplish much in a relatively short time frame, especially when they put their minds to it.